Tropical Research & Development Centre’s (TRDC) Paryavaran project, which is run in the Western Ghats (Uttara Kannada, Chikkamagalur and Mysore Districts intends to address the issues of climate change by working in collaboration with local farmers. This is done through regeneration, enrichment of plants in deforested areas, promotion of eco-friendly boiling water chulas, enhancement and restoration of wetlands/ water resources, and conservation of wildlife. •	Rainwater harvesting pits contribute to resolving water shortages in catchment areas of Varada river basin. •	TRDC’s volunteers initiate discussions with the local communities on the same. •	The pits fill 5 – 20 times during the rainy season. •	This enhances the moisture in the soil and results in enhanced vegetative cover and ground water levels. •	The pits will also delay the water run off on high slopes and increase water table level and reduce flood impact. •	In the year 2013-14, 1330 rainwater harvesting pits were developed in 3 villages. Rainwater is the main source in western Ghats of Karnataka. 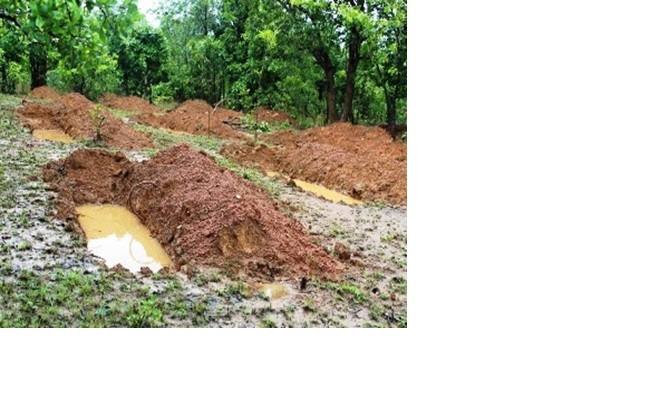 Heavy rain during monsoon used to result in High runoff with lot of soil erosion and acute water scarcity during summer in the eastern part of Sirsi Taluk specially in Bengle, Onikeri village of Sugavi Panchayat. As part of our major water conservation programme started with restoration of a village Lake in Begle village, TRDC has started promoting water harvesting structures of various sizes in the region. TRDC supported communities for promoting rainwater harvesting pits in Bengle, Onikeri villages through community mobilization for rejuvenating first order streams. Rainwater harvesting pits promoted in Bengle and Onikeri have resolved water shortages in the village and duration of availability of water during summer period has considerably enhanced.. It has recharged the ground water and reduced the low flow of water in the first order streams/springs during summer. It has also increased agricultural productivity because of timely availability of water for crops and improved the village ecosystem.